Where The Smokers Are Now: Bulgaria, Greece And Macedonia : Shots - Health News While the proportion of the world's population that smokes has shrunk, the total number of smokers on the earth continues to rise. In 2012, nearly a billion people smoked daily, compared with 721 million in 1980. Where are the smokers? Look for the colors reminiscent of a cigarette ember. Since the surgeon general's report laid bare the health hazards from smoking 50 years ago, the proportion of Americans who smoke has fallen dramatically. About 19 percent of American adults smoke these days, compared with about 42 percent in 1965. Smoking has become less prevalent in other countries, too, including Canada, Mexico and Iceland. 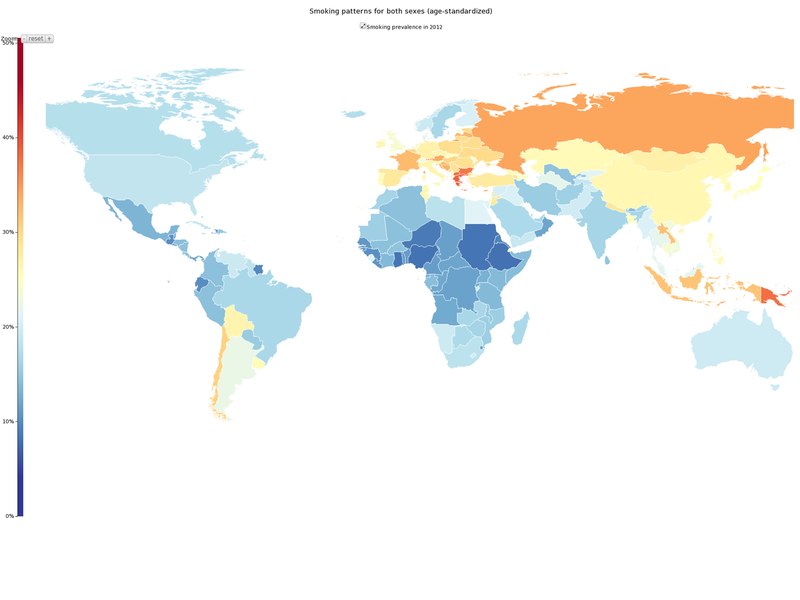 Overall, the prevalence of smoking has gone down worldwide over the past few decades. For men, smoking dropped 10 percentage points to 31 percent in 2012, from 41 percent in 1980. For women, it has been almost halved, falling from about 11 percent to 6 percent over the same period. But that's not the case everywhere. So where is smoking still common? Researchers at the Institute for Health Metrics and Evaluation crunched the data and made them easy to noodle with. The map above shows hot spots. Greece, Bulgaria and Macedonia look like the burning tip of a cigarette. Russia, France and Austria aren't far behind. Click here or on the map to find the tobacco visualization tools put together by the institute. One of the interactive maps lets you look at how prevalence changed from 2011 to 2012. Smoking has gone up recently in Sweden, Belarus and Mexico. It's down in the U.S., Hungary and Argentina. You can also go beyond prevalence, and see how many cigarettes smokers are lighting up each year. By that measure, Suriname stands out on the high side. One last thing about prevalence. While the proportion of the world's population that smokes has shrunk, the number of people on the earth continues to rise. So when you do the math, the total number of smokers has increased, despite all the public health efforts against tobacco use. Bottom line: There were 967 million people who smoked in 2012, compared with 721 million in 1980. The methods the researchers used to estimate smoking and the results of their analysis were published in JAMA, the American Medical Association's journal.